Close ongoing partnership with Google galvanizes 3SS’ position as leading technology partner for operators wishing to maximize Android TV STB and/or multiscreen deployments. STUTTGART, Germany — 3 Screen Solutions (3SS), leading provider of software solutions and services for set-top box (STB) and multiscreen digital entertainment, announces major new advances for Android TV deployments which deliver even further choices and benefits to operators as well as their subscribers. 3SS is launching 3READY Assistant as a new product and service offering, enabled by its 3READY Android TV Operator Tier Custom Launcher. With the help of multiple award-winning 3READY, an operator can now create its own value-adding set of commands to trigger a wide range of desired actions in the app which the viewer might like to do: These new commands range from customer support related actions including billing queries through to PVR instructions and management of advanced parental control features, among many other use cases. Furthermore, the operator can define and customize all these options in any Google Assistant compatible language. This is a major benefit, promoting subscriber loyalty by enabling deeper engagement with the service using voice technology. “Android TV-based deployments are now widely acknowledged as capable of delivering game-changing entertainment experiences to viewers, alongside myriad operational advantages to service providers, as exemplified by Com Hem Tv Hub,” said Kai-Christian Borchers, 3SS Managing Director. In addition to enabling new custom device actions, 3SS is one of the first providers in the industry to introduce cloud-to-cloud based Google Assistant integration. This new cloud-centric system configuration option offered by Google differs from conventional device-centric integration projects. Cloud-based Android TV systems enable the operator to more seamlessly manage service delivery on multiple devices in parallel to the STB. 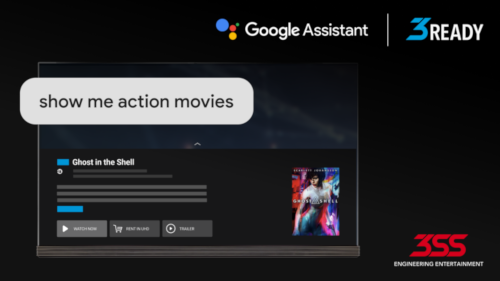 Additionally, the operator can control up to three watch actions which the user can select from within the Google Assistant. In contrast, with on-device implementations, only one watch action can be presented. 3READY Cloud-to-Cloud Integration also enables operators to remotely optimize and personalize search results, and benefit from speedier search results. 3READY has demonstrated its ability to unlock the potential of Android TV, with whatever system configuration or vendor set-up the operator chooses. With the launch of 3READY Assistant, 3SS has further broadened the horizons of Android TV deployments. “We are delighted to be able to help operators get maximum value from their Android-based projects, whatever components they choose,” said Borchers. For the second year running, at IBC 2018 Google showcased 3READY as the reference front end for the Android TV Operator Tier proposition. 3READY was again demonstrated by Google at the recent APAC Android TV Summit 2018, November 12-15, 2018. Earlier in 2018, the 3READY Android TV Operator Tier Custom Launcher was deployed with leading Swedish pay-TV provider Com Hem in the first major hybrid Android TV Operator Tier system, based on Android N. Now fully compliant with latest version Android P, 3SS is working on further major new Android TV Operator Tier projects, to be announced. 3SS has unmatched experience in Android deployments, having delivered award-winning Swisscom TV 2.0 in 2014, and in 2018, Canal Digital OnePlace and Com Hem TV Hub, which has scooped up numerous prestigious industry accolades. Published in September 2018, an information-packed white paper looks a close look at the Com Hem Tv Hub project, and shares insights gained by acknowledged Android TV leaders 3SS and Technicolor from working on Android TV projects around the globe. Click here to download “Deploying Android TV STBs: The A-Z of Android, including Operator Tier”.